Oh, I know what they say about opinions… but can y’all give me your honest thoughts anyway? The good, the bad… the in between.. you’ll have my eternal gratitude…. I think .. no, I know … I have a serious case of decision overload, coupled with sleep deprivation. Click the photos, to see it at flickr & view it larger! Once you are there, simply click the all sizes button above the photo. Sound off on which one you prefer! Next up we have The Altered Abbey Business Card — I’m not 100% in love with it yet, but I’m not quite sure what to tweak either — again, brain overload. Lastly — Some fun stuff … these are a couple of the WIP’s (Work In Progress) pieces I added to my WIP set at Flickr today… Any ideas on where to venture with them? Fresh eyes are always so nice. This 11″ x 14″ piece has been stuck at this point since February, 2007 .. I started it in Dec ’06…. I’m just blocked as to how to move on with him. I love it… but I think fear may be stopping me from trying anything else on it. Hopefully inspiration will strike soon! This piece hasn’t been touched in about a year… it’s been at this point for that long! (worse yet, i started it a few months prior to that) …I also use it as a sample board though for my monochromatic white background workshops. However, I’d like to finish it soon! Thanks so much everybody — I have some absolutely THRILLING news to share with you in the next couple of days! Hi Chrysti, think my preference on the business cards is the blue bird version. Like the contrast in color. Even though it is blue I think because it is a contrasting color it gives it an energy and really sets more strongly in my mind/memory. I work with corporate web sites and work with teams who focus on effective visual “branding”. You want people to remember this look and think of you and your art. IMHO I think the higher visual energy of the blue bird version accomplishes that purpose. I say go with the blue version of the card. Where are you planning on getting your cards printed? I already had the first batch ordered, but the next batch i will revise for the blue i think, i’m partial to it…doesn’t seem as top heavy that way. I agree – the blue is my favourite too. The other one is just too pale. The birdie should be seen nice and clearly ‘cos s/he’s really cute. I think the logo should be a bit bigger on the front of the business card too. Overall it’s a lovely logo. Love the card front, but I like the blue bird better too. I left my comments about the back of the card on Flickr, but I’ll reiterate them here. In my humble opinion, the bracket element is overused, and I found it was interrupting the flow of my reading. I like the brackets, I just think they should be used more judiciously. 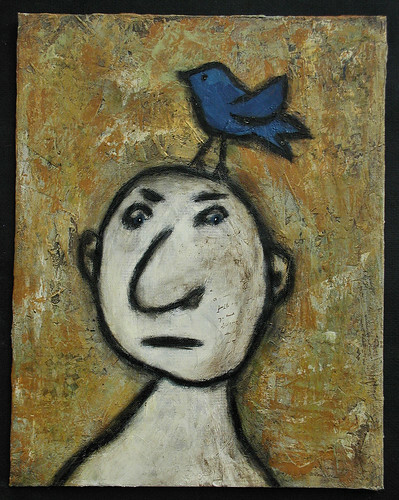 As for the two unfinished pieces – I love the guy with the bird on his head just the way it is. Are you *sure* it’s unfinished? The background on the other one is sensational. I would have a hard time covering it up too. Can’t wait to hear your thrilling news! I agree…the blue helps balance out the card as a whole. Nice touch! 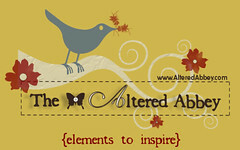 I am not sure about the font choice for the ‘a’ in altered…. The card looks great other than that… something is bothering me about the width of the flourish coming off the letter to the left…if that makes sense…I think it makes the spacing look off and the contrast between the script and the printing differs too much. I like the blue bird one. Yep, it’s the blue one here too! 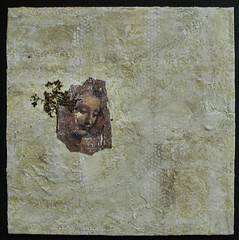 Anyway I love love love the palette and all the elements, and it is definatley YOU! I love the version with the BLUE bird – it balances out the design I think! Very nice. I would do the next batch of cards with the blue bird too. Lovely! I like the blue bird too, I think it grabs attention. Another vote for the bluebird–I didn’t even actually see the light colored bird the first time I looked. voting for the blue bird, it provides a great focal point, and…it just looks cool! I love the blue bird. Congrats on the CPS deal! I hope to be there one day! I prefer the blue one myself. And the guy with the bird on his head doesn’t need much more, if anything. Great work!!! Congrats on CPS. The blue bird sings to me!!! I really like the man with the bird on his head. I like the piece as it is and don’t feel it needs anything else to be finished. I believe adding any other elements to the piece would take away from the simiplicity of this wimsical image. Just my opinion. The birdhouse you made for Nici is oh so wonderful. I’ll bet you didn’t really want to give it away after you finished it (I know I would have wanted to keep it for myself!). I’m sure she will love it and treasure it always. Thanks for generously sharing your artwork, tutorials, etc.